Pixar’s animated marvel may not reach the same heights of wonderment as a ‘Wall-E’ or a ‘Ratatouille’, but those are tough boots to fill and this short, sharp and sweet fantasy still manages to reaffirm its makers as world leaders in the kind of popular animation that embraces ideas and the real world alongside fun and fantasy. There’s just one problem: how do you wipe away a tear while wearing those chunky 3D glasses? Neither a rat nor a robot, the film’s hero is Carl Fredricksen (voiced by Edward Asner), an elderly man of Middle America who as a youth dreamed of becoming an explorer like Amundsen or Scott. Work and family took over, years passed, and now he’s a long-faced widower, living in an old-fashioned home right in the middle of a metropolis. White-haired, square-jawed and stout, he looks like a more homely version of an older Norman Mailer. To outsiders he appears a frail grump, but we know he’s mourning his wife and – in some ways – his life. The film is co-directed by Pixar stalwarts Pete Docter and Bob Peterson and – like ‘Wall-E’ before it – knows the value of silence as well as the need for souped-up action episodes to keep kids awake. As in ‘Wall-E’, too, the most grown-up stuff comes early: a brilliant, melancholy chapter, free of talk, runs through Carl’s life from boyhood to dotage, its triumphs and disappointments: it’s a staggeringly effective, sad sequence. The story begins as the authorities threaten to place Carl in care after he has a scrap with a property developer looking to bulldoze his home. Carl’s response to this bureaucratic heavy-handedness is a bugle call to the gods of animation. 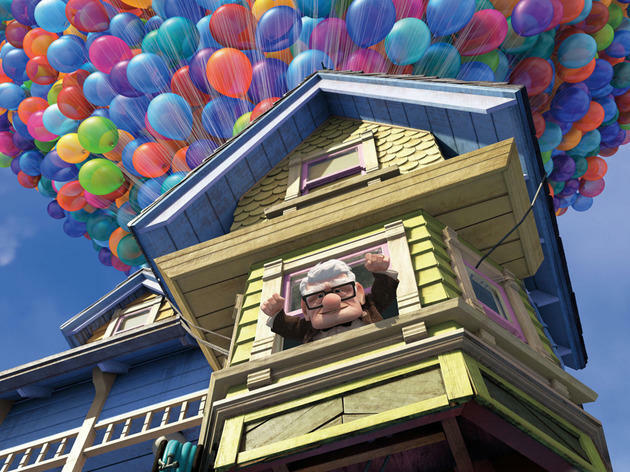 He ties a thousand balloons to his home and floats off, house and all, to South America to find the waterfalls which he and his wife always dreamed of visiting. But he doesn’t bargain on a passenger. In tow is Russell, a podgy child and a wilderness explorer, who wants to help Carl cross a road so that he can win an achievement badge.The balloons are a showcase for modern digital animation as they convincingly float and shimmer; the jungle, too, is a canvas for an explosion of colours and various strange beasts. There’s a touch of ‘Fitzcarraldo’ as Carl and Russell drag this old man’s home through a jungle while fighting off the maniacal ambitions of an even more elderly adventurer who lives in the wilderness. 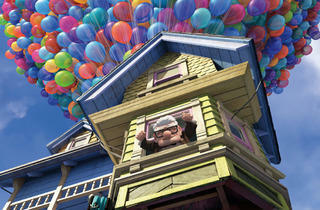 It’s not the only element of ‘Up’ that recalls Herzog’s determination to show nature laughing in the face of man. It’s a running theme – and gag – throughout. And there’s even something of Timothy Treadwell from ‘Grizzly Man’ about wide-eyed Russell. So, Pixar triumphs again with a delirious fantasy that has one leg in the human world of hopes dashed and realised, and the other in the cartoon tradition of journeying and adventure. The crisp 3D is never gimmicky and the entire film is blessed with the light and air of bright but never gaudy colours. The critic has got this woefully wrong, this film is in a completely different league to 'Ratatouille' and even manages to surpass 'Wall-E' in just about every area. Without a doubt one of the best animated films I have ever seen. The characters are engaging, the story well written and executed. The film is an emotional roller coaster - when you're not crying of sadness you're crying of laughter. Loved every minute of it - and I'm a bit of a grumpy sod so that's saying something! I actually think that Pixar have raised the bar another level above Wall-E with this. It was a wonderful movie - superb characters, incredibly moving and the funniest animated feature yet. As the reviewer stated, the sequence showing Carl's life was staggering, and I thought the 'Dogs Playing Poker' pastiche was worth the entrance fee alone! This is close to perfect. Moving, beautifully animated, adventure story about friendship and love. It had me crying and laughing from the first few minutes, while the second half kept me gripped with a stream of dramatic, breathtaking adventure sequences perfect for showcasing the 3D animation. Fantastic. Thoroughly recommend for adults and kids alike. I strongly suggest seeing it in 3D. A couple of good reviews got me out in the rain to see this film and frankly I wish I hadn't bothered. Perhaps its the Disney effect or just that Pixar have lost it, but this is a tired rehash of traditional Amercian cartoon themes that never really got off the ground. Disney demand cute kid, cute animals,funny voices and things to productise in abundance, forgetting the need for a strong script. Up is no different. No clever dialogue or interesting characterterisations beyond behaps the dogs. If you like watching your dog poo on the pavement and buy it toys then this is probably the cartoon for you. It's a great shame because Pixar can be good, but this is below standard. One to take the kids to, but don't expect too many laughs for the grown-ups. THIS SHOULD HAVE BEEN RATED 5-6 stars!